The artist, who passed away April 4th, 2006 at the age of only 48, was a friend of mine and a partner I treasured in discussions concerning art, especially painting, thus many of my perceptions here are informed by long personal conversation. Boetschi’s paintings, including the one under discussion here, Color Unit 24.1, are both idiosyncratic and revelatory. They are idiosyncratic in that they ignore the pressures of many current art world fads, but also in their very compositional reasoning. Each work is a subtle and sophisticated combination of tropes critically utilized in a unique way — one which points viewers toward possible personal revelations of vision. Boetschi displays unadulterated and courageous antithetical awareness. His paintings make clear reference to the minimalism of Donald Judd and the geometric abstraction of the hard-edge and art concret painters. Nonetheless, he denies and inverts several of their key premises. In his paintings, he acknowledges geometric art’s tradition, but also shows that he has taken postmodern doubt to heart. Boetschi extends the metaphors of this style, sometimes by “backing-up,” sometimes by leaping forward. He paints, a method Judd abandoned to go into a three-dimensional form falling between painting and sculpture which he termed the “specific object.” Yet, Boetschi’s surfaces are immaculately smooth. The only evidence of the object being hand-painted is the infinitesimally raised edges due to paint thickness where fields of color meet. The choices of hue are unique and playful, not primary and pedantically balanced as in art concret. The materials are traditional, unlike Judd’s work. The artist forswears both the utopian aspirations of hard-edged purist painting and the Dada-fathered theatricality of presence in Minimalism. Therein, he is able to re-establish an activity important to early geometric painters such as Piet Mondrian, yet scorned by Postmodernists — the striving after integrity. He becomes technically, by choice of medium, and ethically, through his aim, prior to his composite of predecessors. Boetschi uses a heavily intellectualized compositional strategy based on a grid formed of eight rectangular subdivisions. Generally, his compositions within his chosen constraints violate the standard rules of design as learned in art school. The paintings accentuate skewed arrangements and peculiar color. Strangely irritating yet attractive “off-hues” are adjoined in a seemingly random fashion. There are rarely primaries or even secondaries. Personal, emotional and anecdotal associations accrue to the various tints. Boetschi’s works are intelligent, complex and precariously dissident. Color is a happily difficult entity for trope and for theory in general. It is seldom mapped from the source domain of vision in fundamental metaphors in general speech utterances. This may be because particular colors are so insistently real, so sensual. Although it may be forced into a symbolic role, color does not mimetically represent anything in itself and it cannot be abstracted. It is always a sample of itself. Nonetheless, in many visual artists there is a mix of metonymy and metaphor in their central trope, which thereby allows the incorporation of color. A piece of something, a sample of color, may be utilized as either synecdoche or metonymy. This trope may then be further manipulated as a metaphor or other trope leading to foundational metaphors. As a simple example, one might exactly match several of the multitude of colors of “white” people’s skin — none of which one can in any fashion describe as actually white. 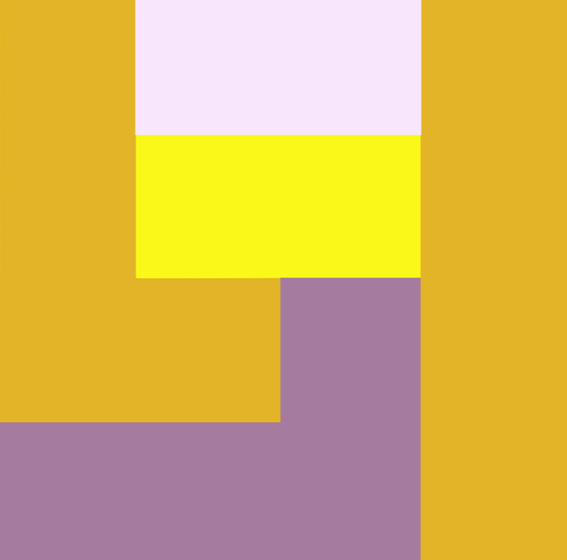 The various yellows, browns and pinks are a synecdoche of humanity, become a metonymy of societal division, and are a clear metaphor for the falsity of racial definition. Obviously, color must come into play in visual art. Much of painting throughout history has revolved around color-formed space. Light and color are inextricably linked for visual artists. Foundational metaphors of light are thus often intricately manifested in color. Let us explore this at work in the acrylic painting, Color Unit 24.1 of 1998. The 200 by 200 centimeter piece may be viewed tropaically on two primary levels. First, there is the irregular/regular aspect pairing in the “J”-formed composition. Second, there are the individual, seemingly associative colors used where one would expect strong primaries. There are many additional elements convincingly integrated into the metaphor(m). These include the large size of the paintings, their scale in relationship to humans, the raised edges of the paint and the depth of the stretcher frames. However, these are of somewhat auxiliary importance, primarily displaying the artist’s strength of reasoning in the pervasiveness of his central trope. George Lakoff and Mark Turner describe several prime methods for creatively applying foundational metaphors: extending (developing implications of the tropes), elaborating (adding in details), questioning (casting them into doubt), and composing (bringing two or more together).3 Boetschi is conducting several of these operations in this work, but most importantly he is composing tropes into surprises of opposition (REGULAR / IRREGULAR), thereby throwing their identity into question. His central trope is a productive model of thought. In Boetschi’s metaphor(m) the action of composing and fusing tropes becomes the act of questioning them. There are several ways in which a tropaic path may be established in a painting. In a poem or novel, this is relatively straightforward. These textual works tend to unfold as one reads, left-to-right, top-to-bottom. Thus the phenomenological experience of the reader is the sequential path along which tropes are laid out. Paintings have an at-once far simpler and far more complex presence. The viewer simultaneously experiences the work as a whole and as a sequence, usually the path one’s eye follows through the work, as determined by the composition — what attracts attention first, second and so on. Planning and controlling such consecutive visual paths is one of the staples of the education of artists in art schools and universities. A walk through a single work becomes quite complex. The painting is always being viewed metaphorically on three levels: the whole, the sequence, and the interaction of these two. Although literature, especially poetry, does this to an extent too, it is not as foregrounded or inherently important to the basic construction of textual works as it is to visual works. The speed of the insistent interaction in a painting compels flickering attention, a dialectic, almost split-consciousness. Therefore, Color Unit 24.1 must be viewed metaphorically as a spatial and temporal experience and as an entire entity, including its “internal” (e.g. arrangement, figure and ground) and “external” relationships (such as scale and the history of art). Boetschi is making several analogous and complementary mappings in his paintings. The aspects of form he utilizes in his metaphor(m) are color and geometric composition, through which he plays regularity against irregularity, typifying understanding and learning. His chief foundational metaphor is one common to our culture, if currently theoretically in dispute: UNDERSTANDING IS SEEING, (“I saw the light!”). Kin to this is the famous IDEAS ARE PERCEPTIONS. Boetschi’s personal creative extension is “perceptions are surprising.” Furthermore, philosophically important to his art are the two foundational metaphors IMPERFECT IS IRREGULAR and PERFECT IS REGULAR. His mapping proceeds as follows. “Thinking is seeing,” metaleptically then, it is "painting." Light becomes color, (in Boetschi this is paint, but without obvious stroking, so more of an ocular than a physical presence). His choice of quirky color is the source mapped on the target IRREGULARITY. Furthermore, this yields the target “imperfect,” which in turn yields “discovery” or “surprise” by steps. In an inspired turn of elaboration and extension, the geometry of his compositions is matched to REGULARITY, yet contrarily the arrangement of those forms is matched to IRREGULARITY. Geometric yet irregular composition and eccentric, allusive colors are manifested very particularly in Color Unit 24.1. The eight rectangular units have pleasing proportions, their length being twice the distance of their width. Any sense of stability this could contribute to the composition is undermined, however, by the fact that they are arranged both horizontally and vertically in a rather willful, non-serial fashion. A classic shape feels highly conditional. They do not line up in an obvious manner. This plays on our expectations rooted in the foundational metaphor COHERENT IS ALIGNED (“I couldn’t get the facts to line up”). Boetschi is hinting at incoherence and clearly manifesting disparity. DISPARITY IS CHANGE is an important foundational metaphor (“His books are getting shorter”). By bringing these two together, his central trope is thus particularized to suggest that a change in what we perceive as coherent is necessary. Since seeing is a form of cognition and ideas are models, his insight invites broadening to perception and life in general. Boetschi’s rectangular units are contained within the overall square of the painting’s form. This is an inversion of the expectation one has from the history of compositions based on the Golden Rectangle. The famous Minimalist Agnes Martin also often inscribes rectangular segments within square paintings. She has described the effect. “The little rectangle contradicts the square. And the square is authoritative.”4 Although Martin uses much smaller rectangles, the point made by both artists is similar. Stability and authority are both presented and denied. THEORETICAL DEBATE IS COMPETITION, (“They have rival theories”) read in reverse, is united with STATES ARE SHAPES (“He refuses to fit in”), together questioning all our metaphors based on coherence, stability, and (thereby) authority. The central figure in the work is a short-capped, long-based “J.” It can be read as a tri-colored figure on a butterscotch ground. This, too, is highly provisional. The “J” seems to be formed of pixels which are much too large; it calls to mind the random doodles on graph paper of a distracted science student: filled-in squares forming faces, little stick figures, or initials. Additionally, it is too top-heavy and lopsided to the left. A viewer’s eyes begin at the top, travel down the shaft and then turn rapidly to the left where they wish to zoom off the edge of the painting. Boetschi presents this so self-assuredly, however, that many a design fundamentals teacher would break his theoretical neck justifying this composition in standard Bauhaus-derived terms. However, the painting vigorously denies such a reading, which is an important aspect of Boetschi’s metaphor(m). “Importance is central” and EMOTIONAL STABILITY IS BALANCE are blatantly negated. Color Unit 24.1’s geometric structure displays a composite of elaborations and variations on foundational metaphors concerning regularity and irregularity. This composite is then utilized by the artist as a self-interrogating metaphor which causes us to mistrust our definitions of these concepts. As potent as this formal composition is in its own right, it acts to present color in an even more unique and overwhelming way. Boetschi frequently professes that color is the raison d’être of his work.5 That is, color itself — not color theory or color therapy, which many mistake for color as experience. There are hardly ever any primaries in this artist’s work. In fact, there are seldom secondaries or tertiaries. The choice to work with only red, yellow and blue, familiar from so much hard-edge painting, is revealed to be a conceptual act negating color by relegating it to simple formulaic, arithmetical permutation. In contradistinction, Boetschi creates an intuitive calculus of color desire. The hues are so specific, yet so unnamable, that one feels drawn to refer to personal associations. Their suggestiveness is precarious, though, by being adamantly referentially indeterminate. Color refers directly to life outside the confines of formalism, yet retains its personal integrity by refusing to be a symbol. The “background” hue in Color Unit 24.1, that to the left and right, is an acrid butterscotch, equally attractive and repellant. The almost-white at the painting’s top is exactly poised between white, grey and lilac. Or is it simply assuming these guises because of the surrounding tints? The yellow recalls Vermeer’s pearlescent highlights on gold, yet it is colder, like the sun on a beautiful winter morning. The grayed lilac below seems paradoxically both tasteful and tasteless, were it a fashion or interior design choice. It is as friendly as the butterscotch is discordant. In another context, it could well be a cloying variation on ancient rose, yet here it seems to ring like a bell. 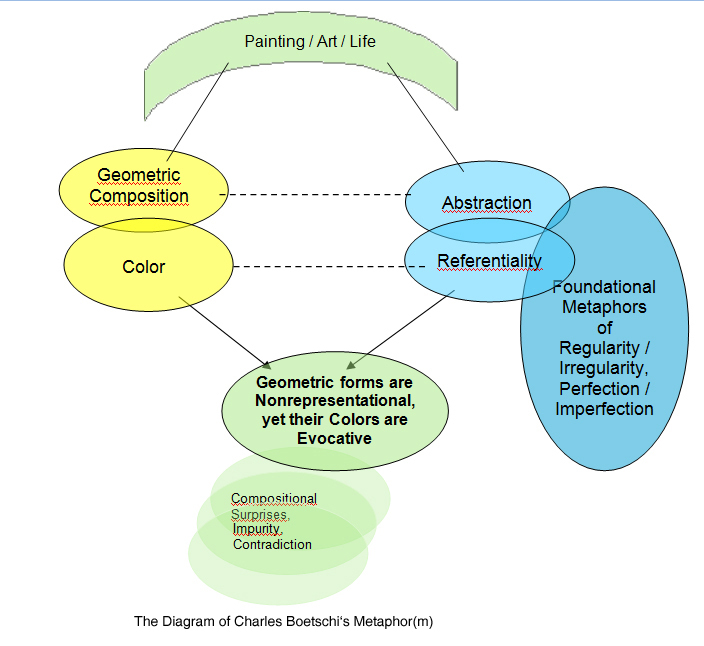 Boetschi’s color references while often metonymic are all additionally similes, more than metaphors, each foregrounding its own conditional like or as. These colors are decidedly not balanced, yet masterfully composed. The size of the work at 200 by 200 cm allows the viewer to swim in the colors, fully reveling in the stream of associative perceptions. In color, Boetschi most clearly particularizes his central trope. UNDERSTANDING IS SEEING is driven home with quiet force — color is not allowed to become a color name, seeing is not allowed to drop to mere verbalization, understanding is both a sensual and rational experience, not something one can memorize nor a mere pun. Imperfection becomes perfection. REGULARITY metaphors are not only played off against IRREGULARITY tropes, rather IRREGULARITY proves REGULARITY to be a misconception, overwhelming and replacing it sensually. Since OPPORTUNITIES ARE OPEN PATHS (“Her new job offers her better paths of development”) and IDEAS ARE LOCATIONS (“He’s always jumping to conclusions”), Boetschi’s painting offers a new, more open possibility for envisioning and finding better perceptions. Color Unit 24.1 is an instance of what Daniel Ammann has termed “the allusive game.” He discusses this in the novels of English writer David Lodge. … I have concentrated on selected examples of intertextuality as they occur in their immediate contexts. Separated from the whole, they can only be hints for what might be salient aspects in an overall interpretation. In Color Unit 24.1 one sees the potential for such highly complex, “wider scale,” creative, yet refined metaphoric structure in painting. Boetschi’s metaphor(m) is multi-layered, allusive, interpictorial (to mimic the word intertextual), and permeates every element of the painting — most of all color and geometric composition. Let us graph his central trope in a blending diagram. His personal central message is that unbalanced surprises in color and composition show the contradictory truth of experience. Boetschi maps geometric composition on abstraction (and its associations of regularity, nonrepresentationalism, even coldness) and simultaneously oppositionally blends the colors of the geometric forms with referentiality and evocativeness. Thus his metaphor can be stated in several fashions including: “Geometric forms are nonrepresentational, yet their colors are referential.” His central equation is: “Composition and color are visually irregular,” thus yielding “surprising perception,” which imparts “new ideas,” which supply “understanding.” The postmodern complexity in this metaphor(m) is the fact that his image-mapping relies on our expectations from the history of the forms with which he works. Significantly, this painting is both idiosyncratic and global in implication. George Lakoff and Mark Turner, More than Cool Reason: A Field Guide to Poetic Metaphor (Chicago: The University of Chicago Press, 1989), p.159. Lakoff and Turner, More than Cool Reason, pp.67-72. Joan Simon, “Perfection Is in the Mind: An Interview with Agnes Martin,” Art in America, May 1996, p. 86. Charles Boetschi, personal communication, St.Gallen, Switzerland, 2000-2006. Daniel Ammann, David Lodge and the Art-and-Reality Novel, Anglistische Forschungen, no. 216 (Heidelberg: Carl Winter Universitätsverlag, 1991), p. 86.